Aside from the Fast & Furious 9 release date being announced last February, very little is known about this action sequel, except that it is definitely happening. Chris Morgan, who has written all but the first two Fast & Furious movies, will likely be on board to write the script, although it hasn't been confirmed who will direct at this time. While promoting the home video release of The Fate of the Furious, director F. Gary Gray teased that the franchise may actually be launched into outer space. Ever since the franchise started in Los Angeles with 2001's The Fast and the Furious, the franchise has been a globe-hopping affair, heading to Miami, Tokyo, Rio de Janeiro, Abu Dhabi, London, New York City and even Cuba in this year's The Fate of the Furious. 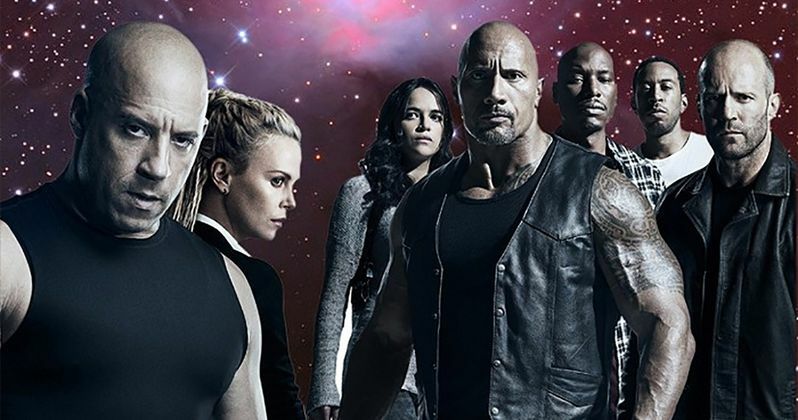 While Fast & Furious 9 will likely take the franchise to another new locale, there have been jokes that the franchise may actually go to outer space, since they are running out of places to race their cars at on Earth. During a new interview with Screen Rant, F. Gary Gray was asked about the possibility, teasing that, after working on The Fate of the Furious, he wouldn't rule anything out with this franchise. "Outer space? Listen, I wouldn't rule anything with this franchise. When I read submarine I'm like 'OK, anything's possible'. [Laughs] You never know. I haven't read "Dom on Mars" yet but again, you just never know." We also reported in April that The Rock and Vin Diesel have ended their "feud," with both actors set to return as Luke Hobbs and Dominic Torreto in Fast & Furious 9. While no plot details have emerged yet, writer Chris Morgan teased in a recent interview that it may be possible for the Han character played by Sung Kang to return, even though he was killed off in Fast & Furious 6. How this will happen is unclear, but we also recently learned that the sequel may also lose one of its most important characters. We reported last month that Fast & Furious franchise star Michelle Rodriguez threatened to walk away from this iconic franchise if the women weren't treated better. The actress would not divulge specifics about how the women are treated, and it's unclear if she's referring to a disparity in pay between the male and female co-stars, which has lately become a hot-button issue in Hollywood, or if there are other ways that the female stars are mistreated. Vin Diesel also revealed on social media that he supports Michelle Rodriguez's stance, although it remains unclear if she will in fact bail on Fast & Furious 9 and the franchise finale Fast & Furious 10, or if she'll ultimately come back as Letty.